Joel Rosario was born in 1985 in Santo Domingo, Dominican Republic. He was raised with his 12 other siblings on a farm where they used horses and donkeys as transportation. At 13, Joel enrolled in the Dominican Republic’s jockey school and completed his training in 6 months. By the time he was 14, Rosario was already a professional jockey and received his first career win at the Galapagos Hippodromo V Centenario. In 2006, he moved to Northern California to test his skills as a jockey in America. By 2009, Rosario had moved into the upper echelon finishing fifth overall on the earnings list with $13 million. In December of 2009, he tied a record at the Hollywood Park Racetrack, winning 6 races on a single race card, a feat that had only been achieved by a few Hall of Fame jockeys, including past Hartack Memorial Award winner, Kent Desormeaux. 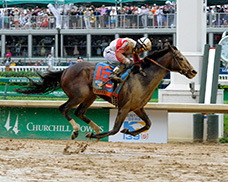 He made his first Kentucky Derby appearance in 2010, where he finished fourth aboard Make Music for Me. In 2011, Rosario won his third consecutive Del Mar and Hollywood Park titles along with his first Santa Anita Crown. 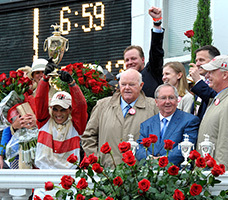 Rosario started his 2013 season with a huge win in the $10 Million Dubai World Cup aboard Team Valor's Animal Kingdom. 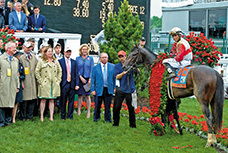 Less than a month later, Rosario raced through the mud and the muck to win the Kentucky Derby on Claude “Shug” McGaughey’s trainee, Orb. He then broke the Keeneland spring meet record of wins with 38 in 2013, surpassing Randy Romero’s previous record of 32, pushing Rosario to the top spot on the National Earnings List for Jockeys. Still, Rosario remains humble but confident, giving all the credit to the horses he rides. Whether it is a $10,000 purse or a $10million purse, Rosario gets on the horse with the same demeanor and a confident grin.